Indie title No Time to Explain has acquired thousands in funding dollars by allowing donators to become level designers. Want to be a game designer, but don't know how to make it happen? A spare $25 can net you the opportunity to have your work published in Tiny Build Games' No Time to Explain, but you'll have to compete with over 100 others (as of this writing). The small indie outfit started up a Kickstarter page after No Time to Explain's first trailer went viral and drummed up a ton of interest. Tiny Build Games asked for $7,000 to aid in the development of the game for the PC and Mac, with overflow going toward iOS, PS3/NGP, and Xbox 360 ports, in addition to booths at popular shows like PAX Prime. A few days in, the donations are already approaching $10,000. Pledges of up to $5 net donators a copy of the game on the PC at launch and a digital poster, but it's the $25 mark that really hit a nerve with fans. For a $25 donation, Tiny Build gives access to No Time to Explain's level editor and promises that quality levels will be included in the final product. Close to $3,000 has already been brought in from this donation level alone. The $150 level is also interesting, offering the chance to create and place an in-game advertisement. 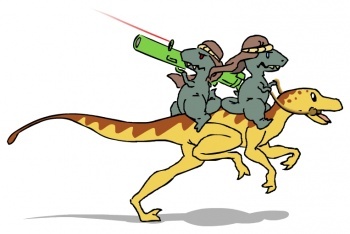 In short, No Time to Explain features time travel, dinosaurs wielding bazookas, and pterodactyl jet fighters. Those three alone are worth about $5 to me. With 43 days to go in the funding effort, No Time to Explain could balloon past the greatest hopes of its creators.